There’ work to be done with this haul….. This weeks haul… Mostly for the Art trail, but the markets will benefit aswell. Clockwise from top left (disregarding my sewing machines): Wadding for padded bags, carry bags for customers, white (6m) & pink (4m) for display swathing, canvas stands small & large and bag hangers, green and pretty blue floral material for a cute bag, sponges for mixed media, safety pins, a wooden bead and a hooge flower to add to a nice bag. My table is still a mess, and until this is over it won’t get much better. I am tempted to move my table so it is adjacent to the wall rather than against it as the heater is under it – the heat doesn’t move around the room much, but my feet do get rather toasty.. lol. I’ll post a pic or two and you can share your thoughts. 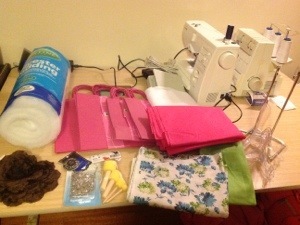 This entry was posted in Beading and tagged bag holders, bags, Beads, Material. Bookmark the permalink.